Hope everyone had a good Memorial Day weekend! (Or at least my American readers…) Son and I went to a street fair near where I grew up that I go to every Memorial Day and Labor Day weekend. We had a lot of fun, and ate a bunch of good food, then went back to my parent’s house and had a BBQ! Yum! By the way, if you haven’t voted in our poll, please go and vote! I really appreciate all your input! Wash and cut the chicken and potatoes into 1 inch square pieces. 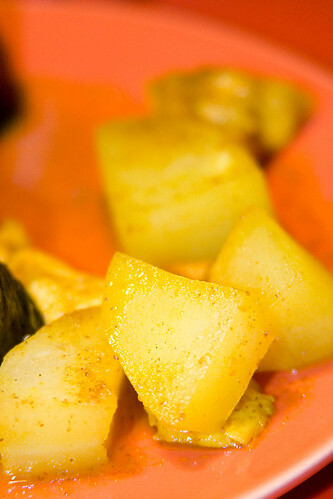 Mix the mustard, honey, and curry powder in a bowl, microwave on high for 1 minute. Place the chicken and potato pieces in a 9″x11″ pan, pour the curry sauce over it. Bake for 35-45 minutes, or until chicken is cooked. Roll the sushi, using the chicken and potato pieces as your fillings. 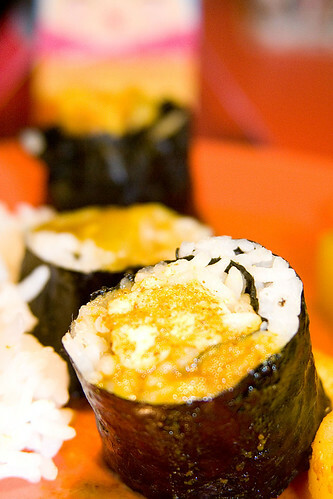 Drizzle the curry sauce over the sushi. Enjoy! A Japanese curry might be a bit easier. You can get S&B curry almost anywhere, and if you just melt down one square of the package in water and use it the way you were using the curry sauce here, it would probably work extremely well and be very tasty. 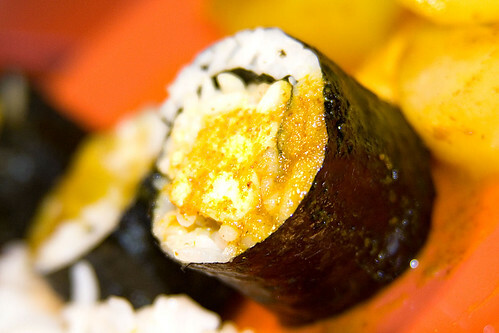 It’s not very sweet, as Japanese curry is more savory than its Thai or Indian counterparts.